It was like visiting family. The staff is very friendly and helpful with great local knowledge. Water and beach are beautiful and clean. Try the fish sandwiches at Charlie's down the road they are unforgettable! The Aitatuki day trip is a must. WiFi works only when you are close to the office. 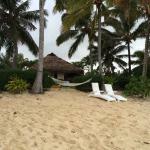 The location is beautiful with a great beach right on Muri lagoon. Beds are very comfortable and the rooms are very light and bright with air conditioning and a ceiling fan. Beautiful hotel right on Muri lagoon. Get quick answers from Takitumu staff and past guests. 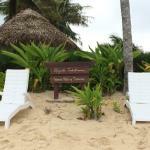 "The honeymoon bungalows right on the beach are amazing but all the bungalows are lovely...private and well..."